The fireplaces of today always bring back the subconscious memories of a family hearth – the glowing heart of a home – to drive the cold away, help relax and forget about the daily troubles. However, when you finally make it to the countryside cottage on a dreary autumn day, the fireplace alone will hardly help to warm up the spaces quickly. Things change when the fireplace is equipped with a KAM fan by VENTS which helps spread the heat evenly throughout the home boosting the fireplace efficiency manyfold. KAM helps your fireplace do better! 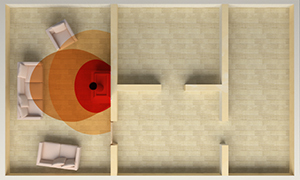 The heat generated from a burning fireplace is hardly enough to warm up the entire space. As a rule, the heat dissipates locally and is only felt within about two metres. 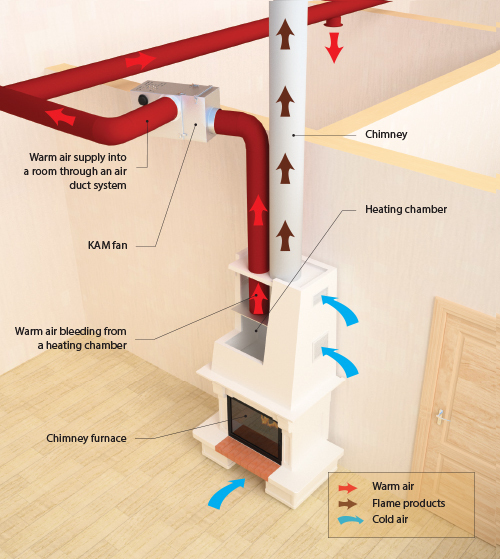 A hot air distribution system utilising a KAM fireplace fan helps to use the heat from a fireplace in a much more efficient manner and create an alternative air heating system in a home without the additional expense. 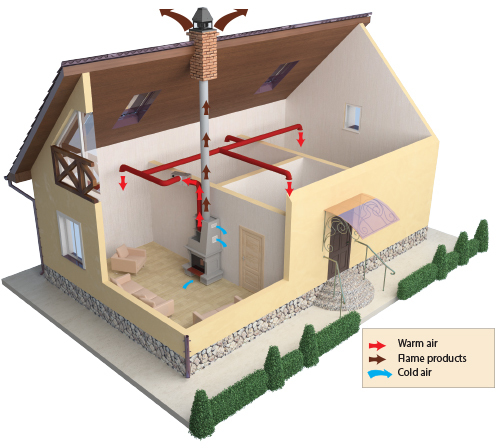 Highly effective for heating homes without a central heating systems which are used on a seasonal basis. Ensures quick and even heating of spaces adjoining the one with a fireplace. Helps use the fireplace heat more rationally: fireplace efficiency with a КАМ fan grows up to 70%. Helps create an energy-efficient heating system. 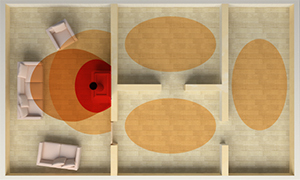 A KAM fan is connected to a system of air ducts to supply warm air into each space. Once the temperature within the fireplace space has reached the desired level as set on the thermostat controller the fan engages automatically to induce the room air, warm it up with the fireplace heat and distribute it quickly and evenly through other spaces. Using the original fireplace heat more efficiently keeps the heating bills to a bare minimum. KAM – the keeper of your family hearth and budget!